Kabaddi is a contact sport that originated in ancient India. It is known by its regional names in different parts of the subcontinent,suchas Kapadi or"Chadukudu"in TamilNadu , Kabaddi in Karnataka, hadudu in Benal, bhavatik in Maldives, kauddi in the Punjab region and chedugudu in Andhra Pradesh. In the international team version of kabaddi, two teams of seven members each occupy opposite halves of a field of 10 by 13 metres (33 ft × 43 ft) in case of men and 8 by 12 metres (26 ft × 39 ft) in case of women.Each has three supplementary players held in reserve. The game is played with 20-minute halves and a five-minute halftime break during which the teams exchange sides. The teams take turns sending a "raider" into the other half. To win a point, the raider must take a breath, run into the opposing half, tag one or more members of the opposite team, then return to their home half before inhaling again.The raider will chant "kabaddi, kabaddi" with their exhaling breath to show the referee they have not inhaled.The raider will be declared "out" and will not gain the point if they inhale before returning to their side, or returns without touching an opponent.The tagged defender(s) will be "out" if they do not succeed in catching the raider who tagged them.Wrestling the raider to the ground can prevent them escaping before they need to inhale. Defenders may not cross the centre line (the "lobby") of the field and the raider may not cross the boundary lines. However, there is one bonus line which can grant extra points for the raider if he manages to touch it and return successfully. Players who are out are temporarily sent off the field. Each time a player is out, the opposing team earns a point. A team scores a bonus of two points (called a "lona"), if the entire opposing team is declared out. At the end of the game, the team with the most points wins. Matches are categorised based on age and weight. Six officials supervise a match: one referee, two umpires, a scorer and two assistant scorers. There are four major forms of kabaddi played in India which are recognised by the amateur federation. 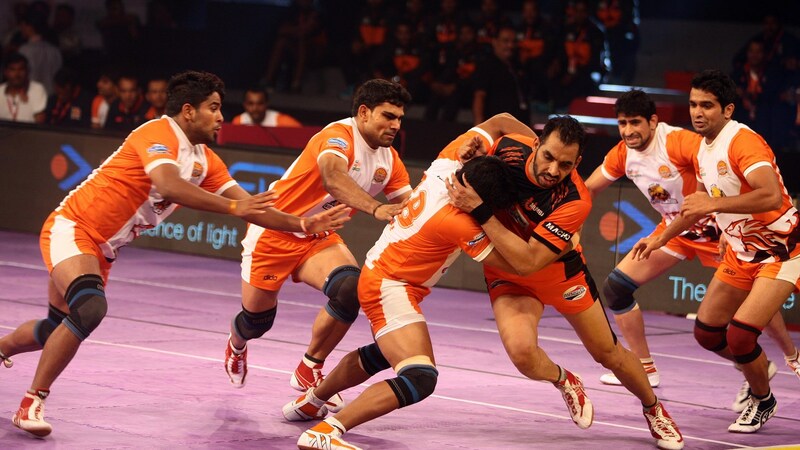 In Sanjeevani Kabaddi, one player is revived against one player of the opposite team who is out – one out. The game is played over 40 minutes with a five-minute break between halves. There are seven players on each side and the team that outs all the players on the opponent's side scores four extra points. In Gaminee style, seven players play on either side and a player put out has to remain out until all his team members are out. The team that is successful in ousting all the players of the opponent's side secures a point. The game continues until five or seven such points are secured and has no fixed time duration. Amar style resembles the Sanjeevani form in the time frame rule. But, a player who is declared out doesn’t leave the court, but instead stays inside, and the play goes along. For every player of the opposition touched ‘out,’ a team earns a point.Punjabi Kabaddi is a variation that is played on a circular pitch of a diameter of 22 metres (72 ft).